Cameron Satterlee: Hello, we are sitting here today for the next radio interview. I am with Ava and Caleb. So what is your radio time in our new semester? Caleb Minnick: We do it on Mondays from 3 to 5. I just actually had to think about that cause we’ve only done one show so far (laughs). But yes that is correct. Ava Anderson: Yeah Funday Monday. I guess that’s our new day. We were on Taco Tuesday last semester so we had to make a name for Monday. AA: Manic Monday! I like Manic Monday. CM: Who does that song? AA: Yeah let’s get back to the interview. CS: I can tell this is gonna be fun already. So the two of you have DJ names correct? CM: Yes. I am DJ Trust Fund. AA: And I’m the Avacado. CS: DJ Trust Fund and the Avacado? CS: Well hey it’s part of your radio identity now. It’s good that you have a whole story I think. AA: My name was my nickname in high school. Out of the many names I had in high school that was really the only one that I actually liked. CM: Did you have other sinister nicknames or what? AA: Well people would call me Flava or Ava Ave yeah, or Eva from Wall-E, it got really old. But Avacado, that one I just thought was funny. It was acceptable. CS: (Laughs) alright well how long have the two of you been with KCR? CM: Just since the semester before this one. CS: Well you’ve had a whole semester though which is nice. So you have an idea about the kind of music you play since you are a music show. AA (sarcastically): Rap. Just lots and lots of rap. CM: Yeah I don’t think I’ve played any rap so far. I mostly play indie rock, electronica, just random things I find on the internet. That’s what I go for. And I don’t mean indie like Mumford and Sons, but bands that are actually doing things differently than what you’d normally hear. And Ava, she’s got her own genre. AA: Well alternative is so generic now. Literally you could have reggae to rock to Mumford and Sons but it’s all under alternative. But really I play alternative, indie, 80’s and 90’s, some 70’s or 60’s depending on if I really like it. So really I just stay away from country I stay away from rap. But most of the time we make our own separate playlists and I would say that they really complement each other on the show. CM: Ava’s really into soundtracks. Every time she’s got a song it’s from a soundtrack. AA: I’m a film major what do you expect? I just love film soundtracks, I dunno it’s just different from what you’d hear on a regular cd. It’s kinda hard to explain. CS: Oh I know what you’re talking about. AA: It just stirs a different emotion. CS: Alright so this is a pretty relevant follow up question, so why do you like the kind of music you listen to? Is there any kind of story behind it all for you? CM: I’d say with me, I’m a huge cynic, so basically when I hear a song on the radio and I think “hmm yeah this sounds pretty good”, but then I question it and go “do I like it or do I like it because some marketing people thought that people in my demographic want to hear this song at this time”. So I don’t want to feel like I’m being manipulated in liking music like that. So that’s why I pretty much don’t listen to any music like that or MTV or radio, I just try to find the music myself. And that’s why I’m into the music that I’m into cause it’s more interesting to me. I mean I’ve listened to a crazy amount of 94x, 94.9 and I’m just totally bored of it by now. So that’s why I have to branch out and find this other stuff yeah. AA: And then with me, probably around middle school is when I got into alternative and rock and when I started to pursue wanting to be a film maker. Whenever I watched movies I always thought about the music and how it effects what you get out of a film. I’m not just talking about scores, I’m talking about actual–like if you’re listening to Breakfast Club, Perks of Being a Wallflower, Donnie Darko, or 500 Days of Summer, those are really good soundtracks and you want to think about what that does when you’re watching something. What else am I trying to say? Well whenever I listen to a song that I really like, I think about what I’m imagining or what is something that I could create that could go along with this song and I did that a lot in high school. I remember I was in a video productions class and we’d have to do these journalistic type pieces and I never followed the format, I always just filmed random sports clips and edited them to Angels and Airwaves or something. I like to edit to music and whenever I think about films I think about what music I can use. CM: When did they start putting in songs like popular music, into movies? CM: The Graduate that’s what I was gonna say. AA: Yeah The Graduate is one of my favorite movies. CM: That’s the earliest I can think of, cause you never hear that in films from the 50’s. Just when a song starts playing. AA: If I could tell people to watch a movie for the soundtrack aspect I’d say watch The Graduate. CM: Yeah that was the first one that incorporated popular music into the soundtrack. I think, I dunno, there’s probably other examples. AA: We’re rambling a lot. CM: Yeah we do that on the show. AA: Yeah we just talk like this. CM: We waste forever just talking about random stuff. CS: You’re music DJs but you can’t stop talking. CM: Well we tie it in to what we’re playing. CM: You know what I hate on these terrestrial stations is the morning guy they go on yahoo news and see a funny story and blah blah blah blah and who cares? AA: I dunno, a lot of our show is improved to be honest. CM: No I know but what I’m saying is (what they’re saying) has nothing to do with music or anything. And me I’m really into politics and if they wanted to have a discussion of Middle East politics but they’re not, they’re discussing a cat that got stuck in a tree and a guy fell and it’s worse than a waste of time. AA: Well what I like to do too is that I’ve been to a bunch of concerts and talking about my experiences with the music that I play or something interesting about that band that people might not know. He knows about it. CM: Yeah I like to brag about all the concerts I’ve been to, you know it makes me feel big (laughs). AA: Yeah and then you get to go to all the ones I can’t. CM: Yeah cause she’s not even 21 so she can’t go to them, and those are the best venues. Can you even go to Viejas? AA: Yeah I can go to Viejas, I’ve seen some good concerts. CM: What about Rimac? You can go there right? That’s at UCSD. AA: Yeah I can go to that. I think. I don’t know, I’ve never gone there. CS: Alright well so what would you say is the latest and greatest for the two of you? What’s the new song or the new band or album that you’ve been listening to? AA: Don’t look at me. CM: Well I’ve been going first this whole time I was gonna give you a chance. AA: Ok well I’m thinking. I dunno. One band that I really recently just started to like was Arcade Fire. I saw them in concert in August. I had a few of their songs and their cd but after that concert I got everything. So I guess that’s my recent new favorite. Really I can only think of Arcade Fire. CM: Well here I’ll talk about mine. There’s this one band, I just played it one the radio this week, there’s this band called Mr. Twin Sister. Where are they from? I’m not sure where they’re from. But it’s dream pop, that’s sort of what it’s called cause there are these real chill soundscapes to it. It’s really awesome stuff. You said it was a good track when I played it, and the track is called Sensitive, which is the good one from them right now. That album just came out at the end of last year so it’s pretty new. Something that actually just came out is this guy called Venture X, he makes I guess you’d call it house music. It’s French house like Daft Punk, well not the last Daft Punk album, but the other Daft Punk stuff. He just put out an album in January. Discotheque, which is really good, he’s from Chicago, which is a pretty big house music scene. That’s the stuff I’ve been listening to right now that I think is on the cutting edge. As they say. AA: Well ok so are you talking about new artists that are up and coming? CS: Oh just what you’ve been listening to lately. AA: Ok that makes it a lot easier. CS: So Arcade Fire is fine if you just wanted to go with that. AA: Well just what I always listen to is Arcade Fire, Angels & Airwaves, M83, The Killers, and 30 Seconds to Mars. That’s my top 5. I think it’s my top 5. AA: So those are the 5 I listen to the most, and I’m always looking for new music too. Not the stuff that they overly blast on the radio. If I hear something that is always blasted on the radio I’ll check out their album. So Kongos, they don’t just sing Come With Me Now, they have other songs. So I use the radio like Wikipedia, like a starting point, and then I move on from there. CS: We’ve all been there. Alright so this is not a music related question, but it is related to KCR stuff. It’s a two parter, so how did the two of you become cohosts and do you think you have good chemistry on the radio? CM: (Laughs) no it’s terrible. CM: No we met just at the KCR meeting that they do at the beginning of the semester, last semester. And we had to find a buddy, so to say, they wanted everybody to have a cohost. AA: And I was thinking “oh my god I need to go out of my way to ask people”. CM: Yeah I know and I hate that the most in classes, finding a group or a partner. Everybody’s in their own little cliques and I’m just thinking “oh my god I’ve been left in the dust again”. But anyway yeah so that’s what happened, we were deer in the headlights. I talked to a bunch of people and somehow I found her. AA: Well I know I asked you what music do you like and I thought “okay” cause everyone else was just “no””no””no”. CM: Yeah there were people who were like “yeah I want to do an EDM show”. AA: Yeah and I’m like “no EDM for me”. CM: Or and all classic rock show which I think is totally boring. Or a country show, whatever, and I’m just like “ehh”. CM: And so we decided yeah we could go together pretty well. We were talking about The Smiths or something, we found a bunch of bands that we really liked so we figured we’d team up, you know, a dynamic duo on the airwaves. As far as our chemistry…sure. Of course I’m biased for myself, but we have good chemistry, good banter. AA: Yeah we do banter a lot, but it’s not aggressive, ugly banter. CM: We’re not just complimenting each other either, we do disagree on a lot of stuff. So we make our arguments. AA: Yeah we’re both very big mouthed people but it works. CM: As you can tell we’re taking like ten times too long to answer these questions. This is what we tend to do on the radio too. CS: Hey we’ll it’s your style and it’ll show through in the interview. So I’ve got a last question, I always want to finish with this cause I think it’s fun, so how would your perfect show go? CM: I dunno, I think pretty much the way we do it now is pretty much the way I want it. Actually it’s something she mentioned, but we could make promos. AA: Yeah throughout our show. Cause I could edit stuff for it. CM: Yeah she’s a film editor, so you know how to edit films or whatever. AA: So that’s one revolutionary idea we’re thinking of for our show. CM: But looking big we could have guests. AA: Yeah bands coming in. CM: Yeah let’s have Brandon Flowers on the show. Bob Dylan (laughs). CM: If we’re just shooting for the star here yeah. So yeah a show where we can play awesome music. You know what would be really great is if we could get the station on terrestrial radio. AA: Yeah on real radio that would be really ideal. But then again I think it is cool that we just have a radio station. CM: Yeah I like it. AA: When I tell my friends that I DJ for a radio station they’re like “WHAT no way”. CM: I put it on an internship application and they were like “wow you’re a DJ”. AA: I just really like what we’re doing right now. Like I said, one day if we’re on actual radio and it would be super cool if we had guests that would be pretty awesome. CM: Yeah and if I got lots of sponsorships. I could totally sell out and get rich (laughs). CS: Boy this has been a real interesting interview. Well thanks for joining me, it’s been a good fun time. On that note we concluded the interview and walked back to the studio where I snapped a picture of the duo at the controls. We chatted a bit about music and film, the Oscars were still coming up and Ava was pulling for The Grand Budapest Hotel. I had to get going to class so I bid them farewell. If you want to hear more of Ava and Caleb’s music check out the links I posted and definitely try to catch them Mondady from 3-5 on KCR Radio, The Sound of State. Ava wanted me to link a couple more songs from bands she didn’t mention. Caleb also sent me another song when messaging me about Jethro Tull. See if you can figure out why. 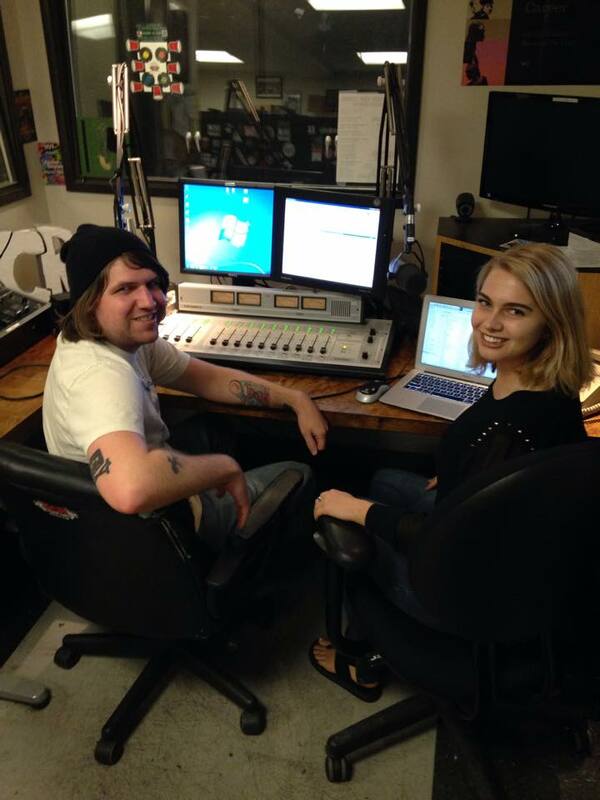 Interested in being a part of San Diego's premier student-run radio station? KCR is an internet based radio station run by students at the San Diego State University that provides music, sports, and talk programs to the SDSU community. © 2019 KCR College Radio. All rights reserved.